Here in Oregon’s Willamette Valley, the basil is lush and fragrant, and sun-ripe tomatoes are hanging like jewels on their vines. The cool mornings remind me that fall is just around the corner and I’d better enjoy these warm days and the garden’s bounty while they’re still here. If I were still living in Italy, I probably never would have attempted homemade pizza as there seems to be a pizzaiolo and a wood-fired oven just around every corner. There are few places in America where this is true, and our little corner of rural Oregon is not one of them. Starting completely from scratch, making both your dough and sauce, pizza can be quite an endeavor. It’s unlikely that I would make the time to do it often. Since pizza is one of my husband’s favorites, I’ve found ways to simplify the process. Most important step is cooking your pizza on the barbecue. 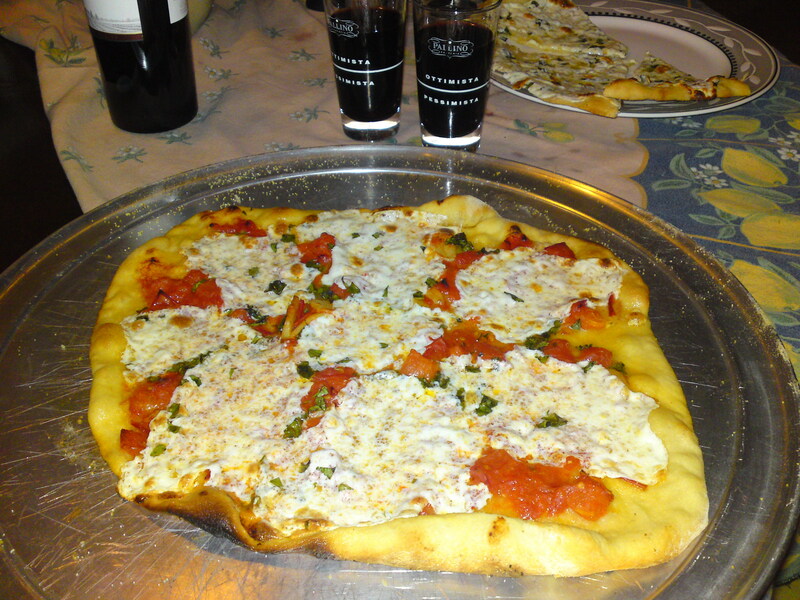 Few home kitchens are equipped with an oven capable of baking a pizza quickly. A well-heated barbecue can do it in 6 minutes, almost quick enough to keep up with Stefano’s appetite. And when he’s on his best behavior, it’s even enough to keep up with a small party. Until we build ourselves a wood-fired pizza oven, barbecued pizza is the way to go. You will need a pizza stone. Although store-bought pizza stones will work, they’re a little thin and a barbecue’s intense bottom heat may overheat the stone. In the past, when cooking with the stones, I kept two on hand so I could switch stones when the other became too hot. These days, I use my homemade pizza stone made from firebricks. I’ve had a few inquiries on this, so I’ll make it a separate post where you can find the information. Have the dough on hand. A few weeks back, I posted the recipe for Chewy Italian Bread — which is what I use for pizza dough. https://kathleencremonesi.wordpress.com/2010/07/31/chewy-italian-bread-barbecued-or-oven-baked/ Included in that post were instructions on how to make more than one batch of dough at a time. Each “loaf” of dough will make three 12″ to 14″ pizzas, depending on how thin you roll the crust. Allow one refrigerated “loaf” to come to room temperature, and you can have barbecued pizza on the table in 30 minutes. Note: When I have time, I prefer to make pizzas out of a “fresh” loaf of dough (rather than a previously made refrigerated loaf) because it’s more willing to roll out to a thinner crust. If I know ahead of time I’m making pizza, I’ll turn a batch of biga into a batch of dough and let it sit in a covered bowl for 2 to even 8 hours until I’m ready. Get creative with the toppings. Use fresh tomatoes and make a 5 minute quick sauce (recipe below). Next time you’re cooking tomato sauce for pasta, make a little extra and set it aside for pizzas. If you’re sauteing mushrooms, make an extra cup and freeze them. Grill up an extra zucchini. 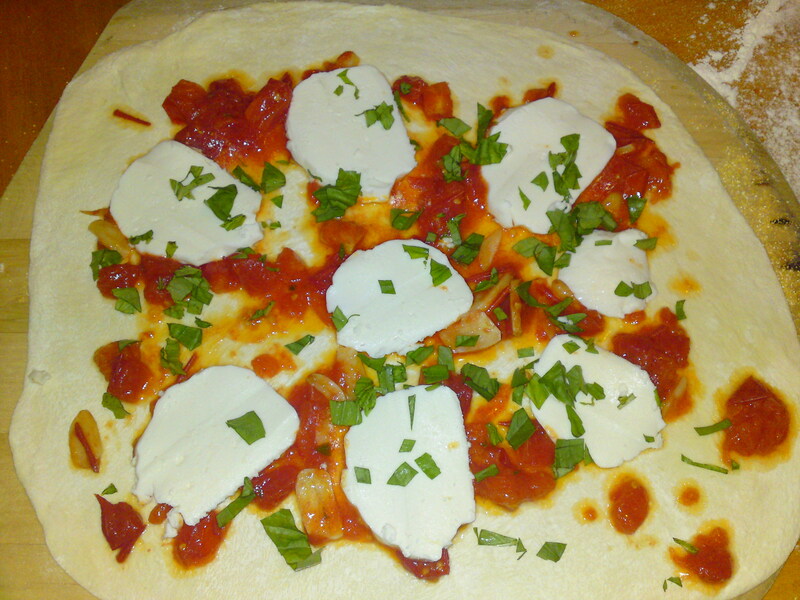 Skip the sauce altogether and make one of the pizze in bianco (white pizzas) below. Have your dough at room temperature, whether it’s homemade fresh, refrigerated, or store-bought, and flatten a softball-sized lump onto a floured board. Although I’ve done my share of dough flipping, just rolling it out keeps the kitchen a little cleaner (and the ceiling). Keep your dough and board well floured, and turn the dough often so you don’t end up prying it off the table with a spatula. Roll it out into a shape that works with your pizza stone. Make it as thin (or thick) as you like, just make sure that it’s not so thin that it won’t support the weight of its toppings as you slide it from pizza peel (or cutting board) onto your pizza stone. 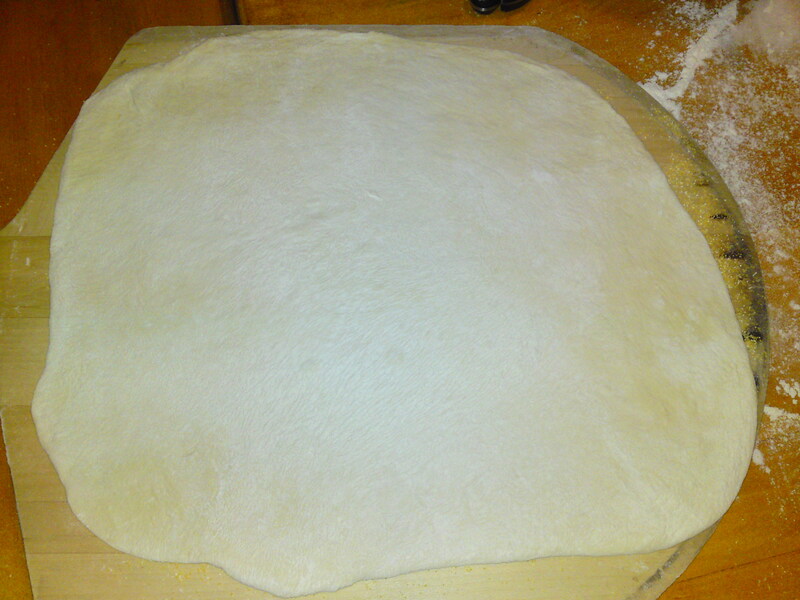 Spread a thin layer of cornmeal on the pizza peel to keep your dough from sticking. ALWAYS wait to put your toppings on until after you have transferred from your workspace to your pizza peel. The longer you leave a topped pizza on the peel, the harder it is to get off. And, yes, I know from experience that it is possible to reach a point where it will not come off in one piece. When transferring the pizza from peel to stone, give it a little side-to-side shake first. Use your spatula to loosen any areas that stick BEFORE you try to slide it off, and keep the spatula handy in case you missed a spot. If your fresh mozzarella is packaged in water, you’ll need to let it drain and dry for a few hours. Mix chopped basil and cubed mozzarella in a dish, pour at least a couple of tablespoons of olive oil on top and smush a bit. Spread on the pizza (this one was a little heavy on the cheese and it ran off the sides when baking). Salt to taste just before serving. In Italy, you can purchase confections of cubed, frozen parsley, and I always thought this was a great alternative when fresh herbs weren’t on hand. I brought the practice home with me. Whenever I pick parsley, I pick a bit extra, chop it up, and stick it in a Ziplock in the freezer. Basil is a different story. Who wants brown flecks of defrosted basil on a pizza? The trick is to keep the cut edges of the basil from being exposed to the air for too long. As with the parsley, when I gather fresh basil, I gather as much as I can, chop it up, set aside what I need for my current dish, and stuff the rest into an ice cube tray I keep just for this purpose. 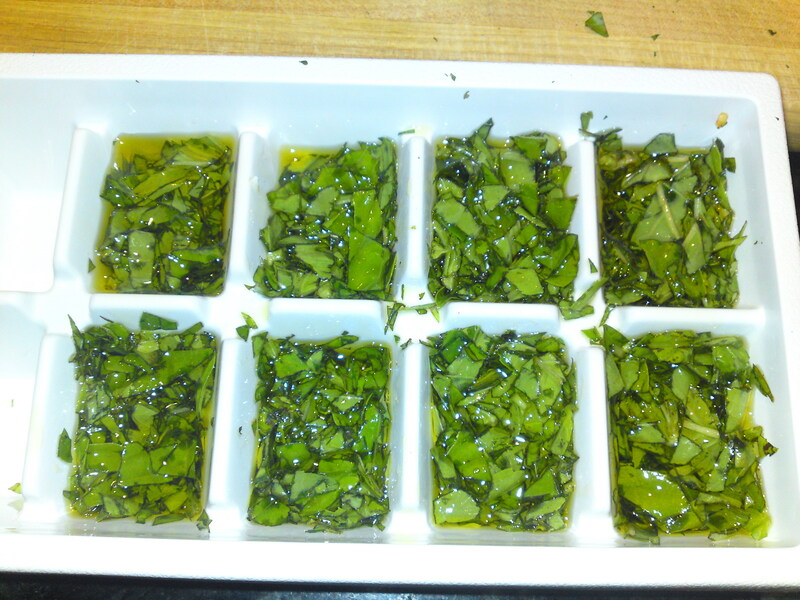 Then I fill the cubes with just enough olive oil to cover the basil (pushing the basil down into the oil with a small spoon once it’s moistened with oil helps), and freeze. Store the frozen cubes in a Ziplock. In winter, it’s the next best thing to fresh basil. 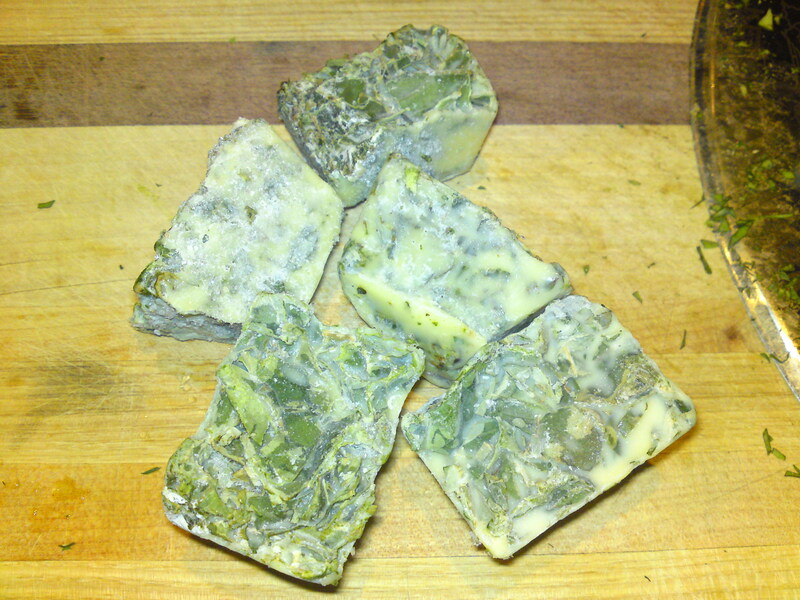 Use the cubes in pasta sauces, soups, pizza, even Pesto! If necessary, they can be defrosted in the microwave on a low setting, and any extra oil (is there such a thing?) can be drained off and used for other dishes. 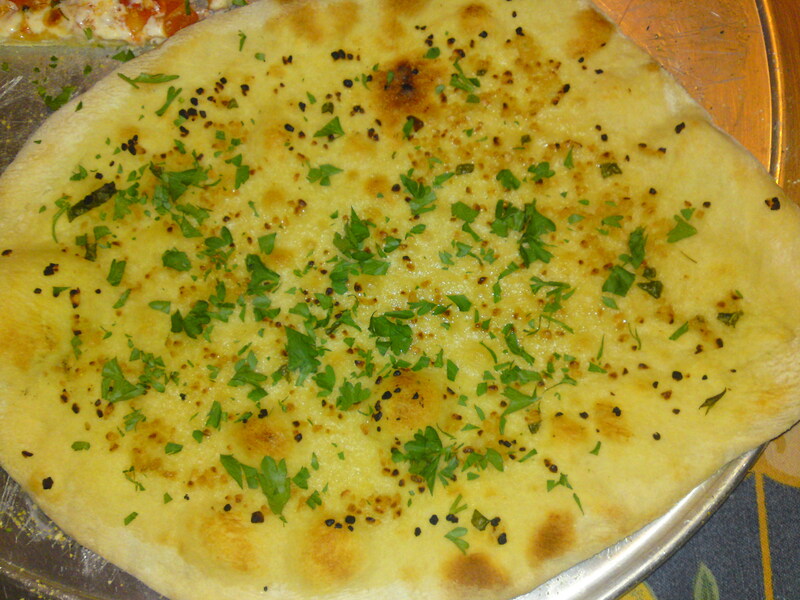 Another one of my favorite white pizzas is this simple “garlic bread” pizza. It’s been almost 20 years since I worked for anyone besides myself, but my last job was waiting table in an Italian pizzeria in Glenwood, CA, ( a blip on Park Boulevard between Oakland and Montclair in the east bay). Sal’s parlor was always packed. More than an appetizer, Sal served this yummy creation as an “appeaser” while patrons waited for their entrees. A simple pizza, named after a princess called Daisy. I’ve consumed more than my share of simple tomato sauces on pasta and pizza over the years, but these days I just don’t care much for most tomato sauces unless they’re either made from barely-cooked fresh tomatoes or if they’re sporca — dirty — as our friend Andrea would say — filled with loads of yumminess like olives and capers and bacon. Saute slices of fresh garlic in a couple tablespoons of olive oil. Strain 3 -4 chopped, plum tomatoes, giving them an extra squeeze as you transfer them from colander to pan. Saute on medium to medium-high. The heating tomatoes will generate some water — don’t cook any longer than necessary to evaporate that liquid. Your tomatoes will start to lose their shape, but should not be cooked long enough to lose their fresh-tomato color. Spoon onto a prepared pizza dough and spread with the back of a spoon. 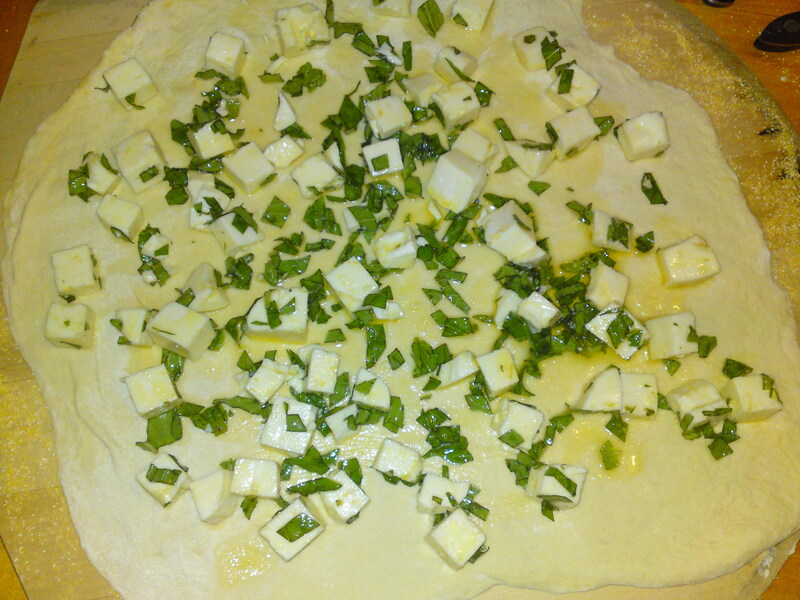 Add a few slices of fresh mozzarella, chopped basil to taste, and get it on the barbecue. And there you have it. Three pizzas start to finish in 30 minutes. Since we were eating the first as the second and third cooked, after 15 more minutes all that was left were the dishes and the last sips of wine. Now, if only I could figure out how to write one of the posts so quickly!!! 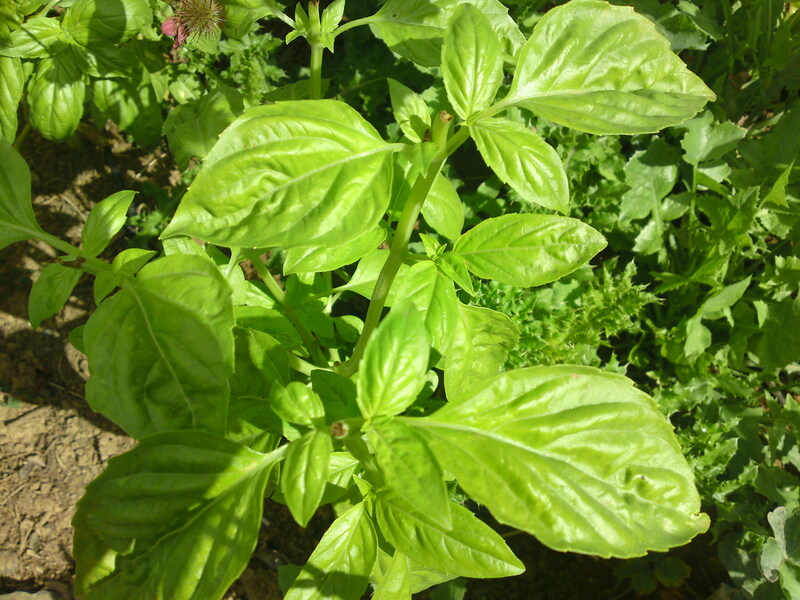 Basil is among my very favorite herbs! 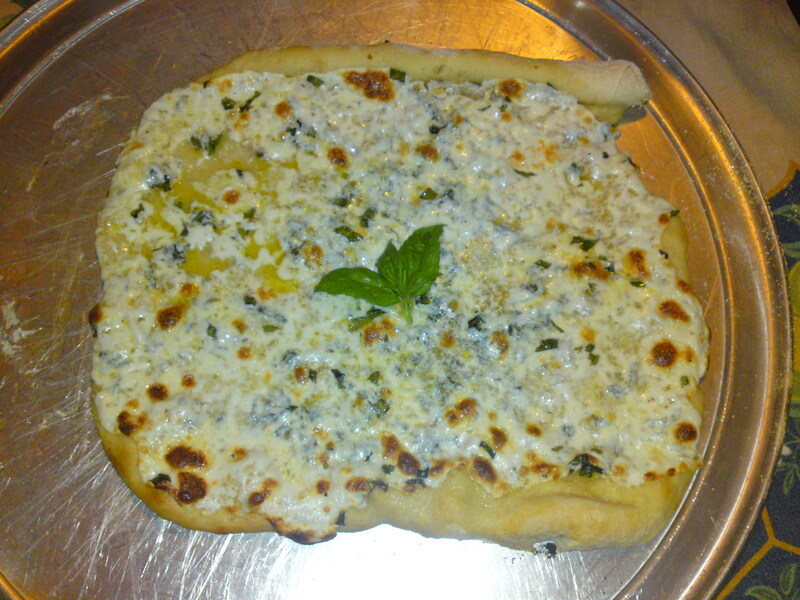 Nothing at all like fresh basil on pizza or other food. I have seen other methods for freezing basil, but none that used olive oil – will definitely give it a try. The pizza recipes look amazing. Thanks! Thanks CulinarySpirits! Peeked at your blog and landed on the recipe for Brussels Sprouts with cranberries and pecans. I love to combine dried cranberries and roasted pecans — just did it a couple nights ago to fancy up some oatmeal cookies. Can’t wait to try the Brussels sprout recipe! please oh please oh please mail me some of that!!!!! yum!!!!! what beautiful, mouth watering, tummy grumbling goodness!!! I love the pizza but the method of saving all the basil in the garden is great. Much better than drying and losing all that flavor.